Monthly shoe clubs are all the rage right now. Actually clubs of all kinds are, but let’s focus for a hot second on the million shoe clubs out there. Just Fabulous, Sole Society, Shoe Privee, ShoeMint, ShoeDazzle…the list can continue on, but really, why bother. That’s a wide enough sample for discussion purposes. Each one offers something different than the other one. With exclusive designs, celebrity collaborations, company collaborations, and fixed prices on everything you generally know exactly what you’re getting, and you always know how much you’re going to pay. On the other hand, are the designs really all that exclusive? In the 39.95 range clubs the Iron Fist designs that Just Fabulous carries are available through Iron Fist, Shoe Privee carries mostly Qupid, which are available in various retail outlets and online stores, and ShoeDazzle actually carries their own brand that are some kind of knockoff of various designer shoes (as is everything). I own a couple pair, and I pretty consistently get compliments on them. ShoeMint, in the $80 price point, offers exclusive Steve Madden/Rachel Bilson designs, but I’m pretty sure they slipped Steve some downers before allowing him to design because it all looks like tamer versions of what’s in the store. (Seriously, try a little color). Plus I’m pretty positive that my closet is the same as every other freaking closet in the entire world because they release all of three designs a month.You also still have to go in and skip the month if you're not interested in dropping $80 the same time the rent is due. 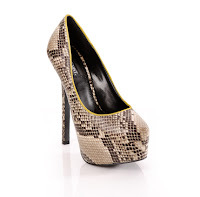 This ShoeMint heels is great, but snake isn't hard to find. The problem lots of people had with shoe clubs was the reoccurring fees. If you don’t remember to skip by some magic date then your account is hit for $40-$80 and now you can’t buy Fluffy cat food. Awesome. Luckily, most places have wised up and realize that forcing people to shell out money for something they haven’t picked out simply because they bought something once was a bad idea. Even ShoeDazzle, the last holdout in that price point, recently did away with the reoccurring charges. So are shoe clubs really worth it? I don’t really have the answer. I guess it’s cool to have new shoes emailed to you every month that were picked by some algorithm driven web bot. And admittedly shoe club shoes are not the best shoes I own, but if you’re looking for a hot trend, it’s a good way to get the look without spending a fortune.